New York City Council recently passed a bag fee, however Washington, DC has had a similar bag fee for many years. 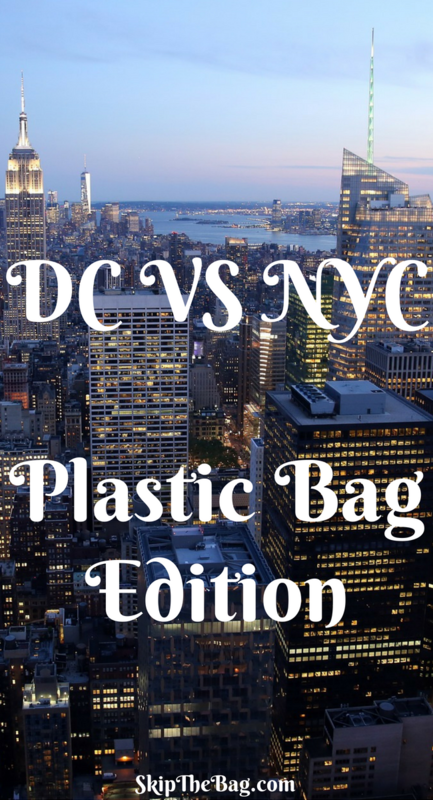 As you may have in my previous post, the program in Washington, DC, has had a big impact and I hope that the NYC bag fee will have a large impact as well. However, the two programs have some differences. Washington, DC (DC): The bag fee was started January 1, 2010. 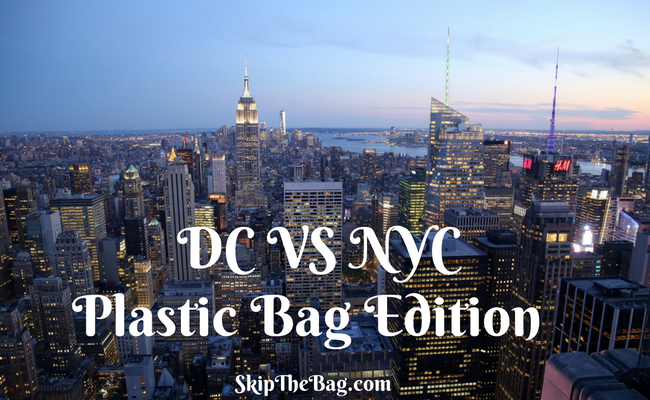 New York City (NYC): Council passed the bag fee May 5, 2016 and it is set to begin in October 2016. DC: It requires all businesses that sell food or alcohol to charge a fee for each disposable paper or plastic bag distributed with any purchase. Restaurants with seating are exempt from the requirement. So doggie bags are still allowed for leftovers. The law also requires that paper and plastic bags sold have specific requirements such as being recyclable. NYC: The bag fee applies to carryout bags from a wide range of retailers including grocery stores, hardware stores, pharmacies, apparel stores, office stores and home stores. Mobile food vendors, food pantries or liquor stores complying with the law about selling alcohol for consumption off the premise. DC: The fee is 5 cents for each bag. Businesses retain 1 cent. They can retain 2 cents if they encourage the use of reusable bags. 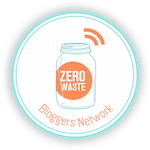 The remaining 3-4 cents goes to The Anacostia River Clean Up and Protection Fund which has helped with stream restoration, education and outreach and trash collection traps to prevent trash from reaching the waterways. NYC: The fee is at least 5 cents per bag. Earlier versions of the bill had 10 cents, but the final bill was passed stating at least 5 cents. So it appears that stores may charge more than 5 cents if they wish. The fee goes to the store owners. DC: There are several exclusions on what constitutes a disposable carryout bag including the plastic bags used for produce or meat, doggie bags from restaurants, and bags from pharmacies. There is no exclusion for those with a low income, but the law did have provisions for them to be given reusable bags. NYC: The law has similar exemptions on what constitutes a carry out bag including meat/produce bags and those from a pharmacy. Patrons on WIC or SNAP benefits are exempt from the fee as are food pantries and restaurants who deliver food. There is also a provision allowing low income households to be prioritized in receiving reusable bags. DC: To clean up the Anacostia River and move DC residents away from plastic bags to reusable bags. NYC: To minimize environmental impact of plastic bags and to get New Yorkers to use reusable bags. Do you think the NYC bag fee will have New Yorkers using fewer plastic bags?